Who Has A Stake In Yemen Fight? 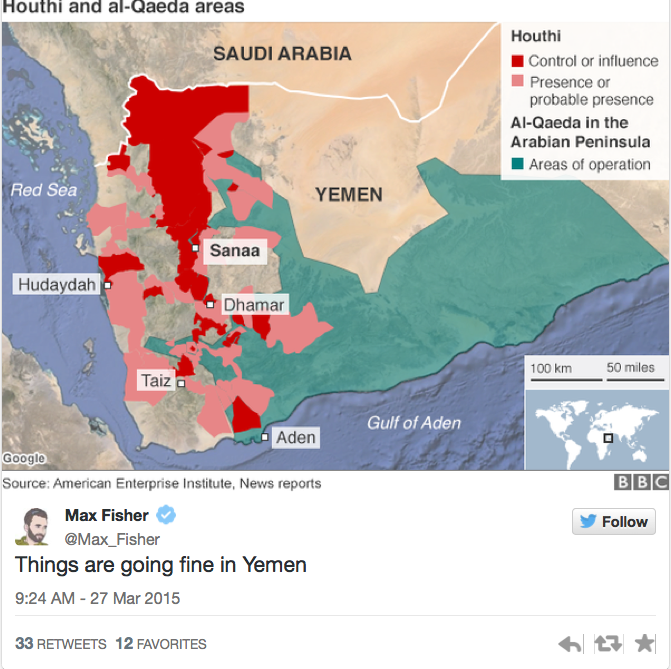 Yemen is at the center of a proxy war between regional heavyweights Iran and Saudi Arabia. It's the source of fears of a broader Sunni-Shi'ite conflict. And it has implications far beyond its borders. Here is a look at the stakeholders in the fight. Two branches of Islam: Yemen is more than 99 percent Muslim, of which 65 percent are Sunnis of the Shafi'i school of thought, and 35 percent are Shi'as of the Zaydi school. Two powerful extremist groups: The Huthis are Shi'ite rebels who first took control over north Yemen, forcing President Hadi to flee, expanded their control through most of the country, and are now moving on his refuge in Aden. On March 27, the group put a bounty on Hadi's head, and used the Yemeni Air Force it largely controls (with Saleh's help) to strike Aden, forcing Hadi to go into hiding. The Sunni militant group Al-Qaeda in the Arabian Peninsula is the most active Al-Qaeda franchise, controls large areas of north-central Yemen, and is pitted against the Yemeni government, Saudi Arabia, the Huthis, southern separatists and, ultimately, the United States. Two regional backers: Iran supports the Huthis, materially and militarily; Saudi Arabia backs the Yemeni government headed by Hadi, and on March 25 led air strikes involving 10 Arab countries against Huthi rebels, leading Tehran to denounce the intervention. The countries involved in the Saudi-led air strikes are Sunni, underscoring broader Sunni solidarity centered on Gulf Arab countries but which extends to Egypt, Sudan, Pakistan, and Turkey, among others. Yemen will be the main topic of discussion at an Arab League summit in Sharm-el Sheikh, Egypt, this weekend, and Hadi will attend. Aside from participants' role in the current Yemen intervention, the gathering of foreign ministers may move closer to establishing a joint Arab military force. The idea has been spearheaded by Egypt and the Gulf states as a way of combating terrorism and staving off Iranian influence. Saudi Arabia has deployed about 100 aircraft in the Yemen intervention, dubbed Storm of Resolve, and planes from Egypt, Morocco, Jordan, Sudan, United Arab Emirates, Kuwait, Qatar, and Bahrain are also contributing. Saudi Arabia is also is contributing as many as 150,000 troops to the campaign, and Egypt, Jordan, and Pakistan have expressed their readiness to take part in a ground offensive as well. Sudan, which has had traditionally good relations with Tehran, also said it was ready to send ground troops. Global oil prices immediately surged on news of Saudi Arabian-led strikes in Yemen. Benchmark Brent crude prices rose nearly 6 percent on March 26 (to near $60 a barrel), before easing a little due to fears that the military intervention could spark a broader regional conflict and disrupt oil supplies. On March 27, prices fell more than $1 a barrel (midday low $57.76) after Goldman Sachs said the Yemen campaign would have little effect on global oil supplies. In kind, global stock indexes dipped, including the U.S. Dow Jones (down 0.6 percent) and London's FTSE (down 1.2 percent). Saudi Arabia, the largest oil producer in the Middle East, has been a central figure in the global fall in oil prices that began in 2014. Oil accounted for some 90 percent of Saudi Arabia's budget in 2013, according to Reuters, yet Riyadh has steadfastly refused to cut production to buoy prices. Iran has characterized the fall in oil prices as the result of a Saudi and U.S. conspiracy against Tehran, whose oil income has been hurt by sanctions over its contentious nuclear program, and Russia, which relies heavily on oil income and is at odds with the West over its intervention in eastern Ukraine. Moscow, which stands to gain from any rise in oil prices, has been working the phones and playing the peacemaker role since the Saudi-led air strikes began. On March 27, Russian President Vladimir Putin spoke with Israeli Prime Minister Benjamin Netanyahu and "expressed concern over the escalation of tensions in Yemen," according to the Kremlin press service. He also stressed the importance of "intensifying international efforts to achieve a peaceful and lasting settlement of the situation in the country." In a telephone conversation with Iranian President Hassan Rohani on March 26, Putin called for the "immediate cessation of hostilities" in Yemen — read by the Iranian press as a call for Saudi Arabia to halt its intervention — and also expressed satisfaction with progress made in the ongoing nuclear negotiations between Iran and the six world powers. The negotiators are entering the end game of talks aimed at meeting a March 31 deadline to come up with a framework agreement over Iran's nuclear program. As Tehran tries to cut a nuclear deal in Switzerland that will result in sanctions relief and allow it to pursue a peaceful nuclear program, it must fend off criticism of a possible deal from regional players Israel and Saudi Arabia. Netanyahu has been openly critical of the talks, which he argues are not going far enough to ensure that Iran cannot acquire nuclear weapons, and has raised the alarm about Iran's growing influence in the region. Riyadh has expressed its own concerns about Iran's encroachment in the region and has sparked fears of a nuclear arms race by saying that any deal that allows Iran to enrich uranium will lead Saudi Arabia to seek the same. Iranian Foreign Minister Mohammad Javad Zarif, who is also Iran's chief nuclear negotiator, on March 26 demanded an "immediate stop to the Saudi military operations in Yemen." He was also quoted by the Arabic-language al-Alam news network as saying Iran would "spare no effort to contain the crisis in Yemen." Turkish President Recep Tayyip Erdogan, who is scheduled to visit Iran in April, has been outspoken in his criticism of Tehran's role in Yemen. "Iran and the terrorist groups must withdraw," he told France 24 on March 27, alluding to Huthi militants. "We support Saudi Arabia's intervention," Erdogan said, adding that Turkey "may consider providing logistical support based on the evolution of the situation." On March 27, Iranian Foreign Minister Zarif responded to earlier remarks by Erdogan in which he accused Iran of trying to dominate the Middle East. "The Islamic Republic of Iran is ready for cooperation with its brothers in the region to facilitate dialogue between various groups in Yemen to maintain unity and return stability and security in that country," Fars quoted Zarif as saying. Iraq finds itself in a tricky balancing act. It is relying on Iranian-backed militias to help beat back an incursion by the hard-core Sunni Islamic State group on the ground, and U.S. air support to strike IS from above. This week, the United States agreed to conduct air strikes in support of Baghdad's effort to retake the Sunni-stronghold Tikrit. Once Quds Force commander Qassem Soleimani and his Iran-loyal militias had left the scene, U.S.-led air strikes followed. During the Arab League summit in Egypt this weekend, Iraq can also expect to hear calls for its participation in the establishment of a joint Arab military force, an idea it has been reluctant to endorse because of its ties to Iran. Yemen, once a poster child of success for Washington, now adds to the complex challenges facing the United States in the Middle East. On the one hand, the United States is in the unlikely position of being on the same side as Iran in fighting IS in Iraq. But in Syria — where it is also targeting IS — Washington is arming some of the groups fighting the Iran- and Russia-backed regime of Bashar al-Assad. And now, the United States finds itself backing (not yet militarily, but with logistical and intelligence support) longtime ally Saudi Arabia against Iran-backed militants in Yemen. All this at a time when Washington is trying to seal a nuclear deal with Iran.